Whether you’re looking to experience the freedom of being your own boss, or excited by the opportunity to succeed and shape your own Dial-a Dog-Wash empire, then you need to understand why joining Dial a Dog Wash is a much safer way to begin your grooming business compared to ‘going it alone’. You will not only have intensive one-on-one training through the Dial a Dog Wash training Academy, you will also have the opportunity for additional training at no extra cost and a network of over 160 groomers to liaise with. You will also receive intensive marketing training as being a ‘good groomer’ does not ensure you will have enough business - it is imperative you know how to attract and keep your customers. With our 28 step guide on tried and tested marketing methods you will have the key to your success. So don’t take the plunge into dog grooming self employment alone. Let the Dial a Dog Wash team, with all their years of experience in grooming, marketing, van conversions and business building help you get the success you deserve out of your business. For all you need to know about how to get your franchise started, and how to get a step closer to your fully equipped mobile dog grooming parlour, just fill in the form now… it will be the best choice you ever make! 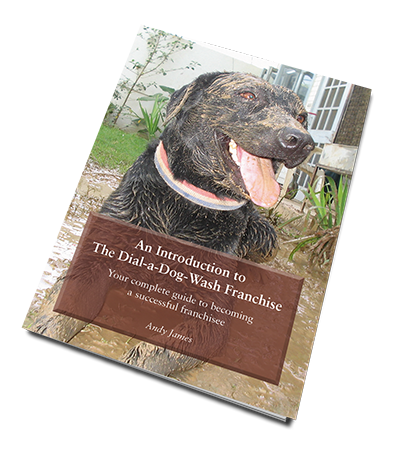 To help you find out more about how the franchise will benefit you and your lifestyle, we would be delighted to send you a free copy of our new guide… “An Introduction to The Dial-a-Dog-Wash Franchise” Inside our free guide you will find answers to why there is such a huge failure rate in dog grooming businesses who ‘go it alone’, as well as answers to the most frequently asked questions about investment in our dog grooming franchise. Discover the truth about your earning potential, and what to expect from our intensive training academy. Just spend a few seconds filling in your details in the form, and your guide will be dispatched straight away with our compliments! Start your own business today with the Dial-a-Dog-Wash franchise – get your free guide now!